This is the time of year when we’re still slightly between seasons. We’re weary of sturdy winter fare but much of what we crave resides in future tense and is yet to come. We make do with what we have, and there are many small joys to be found in that, such as the tangle of tender pea shoots from Meadow’s Mirth that I’d brought home from the Portsmouth Farmers’ Market. After considering the possibilities, I settled on a pesto, and blended the tendrils with a couple of stalks of softly pungent green garlic from Riverside Farm Stand with a handful of bright mint from the garden. This spring-time concoction tastes hauntingly of sweet peas, stays verdantly green, and will go into a week’s worth of dishes — to dress a wheat berry salad, stirred into risotto or a pot full of pasta, smeared onto a flatbread or sandwich, and, as a special treat, a generous dollop on a luxurious piece of wild caught salmon. Pea shoots are the early vining tendrils and leaves of the pea plant, and are also known as pea greens. Shoots are typically harvested from the growing point of snow pea vines, although they can be from any type of garden pea. 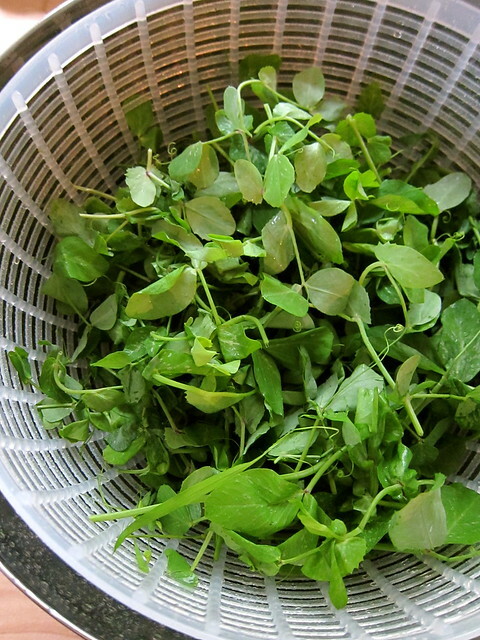 Look for pea shoots in spring, early summer and fall. When they do appear at the farmers’ market, their season is short, as peas don’t grow well when daytime temperatures are above 65°F. Pea shoots are best used within a day or two of harvesting — to store these fragile greens, keep them refrigerated, wrapped in paper towels in a closed bin. If pea shoots aren’t available, pea sprouts or micro greens may be used instead. 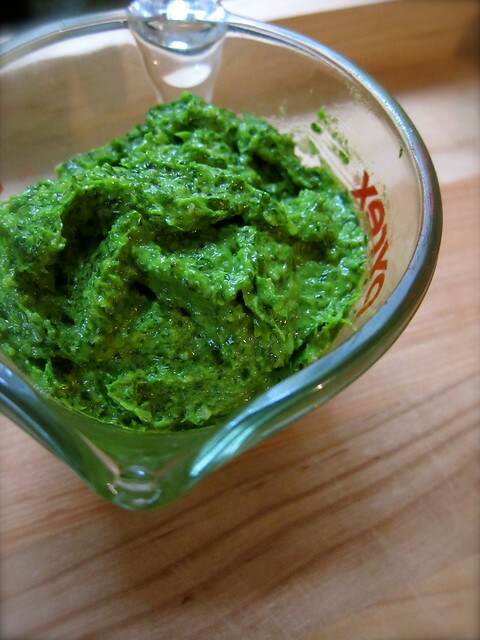 – In a food processor or blender, add pine nuts and green garlic, and pulse until roughly chopped. Add pea shoots and mint, and pulse to combine. Add salt to taste. With processor or blender running, slowly drizzle in olive oil. Process until blended to desired thickness. Makes 2 to 2½ cups. Local ingredients: Pea shoots from Meadow’s Mirth; green garlic from Riverside Farm; mint from the garden. This entry was posted in cooking and tagged green garlic, mint, pea shoots, pesto. Bookmark the permalink. Sounds and looks yummy. I just picked what may be the last of our peas for the season, so that won’t be on our menu this year. I would never have thought to make a pesto of pea tendrils. Great idea!